As we know, the risks of cesareans increase with each surgery which is why family size should be considered when evaluating your post-cesarean birth options. Couple that fact with the results of Mercer (2008) which found that successful VBAC also provides a level of protection to future deliveries. Mercer found that not only do the risks of uterine rupture, uterine dehiscence and other peripartum complications decrease after the first VBAC, but “VBAC success increased with increasing number of prior VBACs” to rates over 90% for women with two or more prior VBACs. They also found that while two or more VBACs did not decrease the risk of rupture further (so a scarred mom’s risk of rupture never goes down to the risk of an unscarred mom), it’s important to note that the risk of rupture did not increase with subsequent VBACs as women are sometimes told in an effort to obtain their consent for a repeat cesarean. Just found out I’m pregnant again!! Super excited! I had a successful vbac with my baby 6 months ago. So I would like to know what the chances of another vbac will be so close together – it will ultimately be 14 months apart. Also, any moms with kids so close together, please give me some good mommy advise of what to expect and how you deal with it? ACOG reports that the odds of acheiving a VBAC are lower with short birth intervals. Keep in mind that the evidence on short birth intervals is limited. I suspect that the most important factors for achieving a VBAC – understanding the evidence and hiring a supportive provider – hold true for you too. I shared your question here and a few people have replied already. If you are interested in learning more about the evidence on short birth intervals, uterine rupture, VBAC success rates, and repeat cesarean, you can get up to speed quick here. I have been searching for this information. It is fantastic to find a study that isn’t just about the first VBAC. Glad you found it helpful Tara! I would be interested if these successful VBAC’s were induced or not. I had a successful VBAC after being induced at 41 weeks, got pregnant 12 months later, was induced at 41 weeks again, and had a complete uterine rupture up my left side. The doctors only gave me petocin for 3 hrs then discontinued it as my contractions had become too intense too early. For the following 14 hours my labor progressed nicely on it’s own. I ruptured when I was about 7 cm. I am so sorry about your uterine rupture! The Mercer 2008 study does provide rupture rates for spontaneous and induced labors in the body of the study. Of the 9,012 women who did not have a prior successful VBAC: 0.87% spontaneous labors ruptured vs. 1.37% induced labors. Of the 2,900 women with one prior successful VBAC: 0.45% spontaneous labors ruptured vs. 0.37% induced labors. Of the 1,620 women with two or more successful VBACs: 0.43% spontaneous labors ruptured vs. 0.63% induced labors. 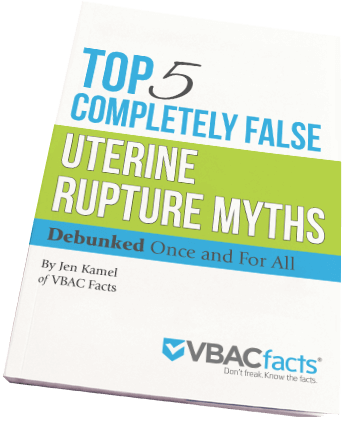 Note that populations of less than 5,000 women do not measure the rate of uterine rupture as accurately as populations greater than 5,000, but this is the best study to date regarding rupture rates after successful VBACs. After having an emergency CS for a breech baby with my second, I have had three VBACs in the last 4 years. It’s been difficult to find docs that will allow me a VBAC but the group I’m with now is really anxious to not put me under the knife. With all three VBACs I’ve been given Pitocin and my last was an official induction as I was not in active labor by my due date. It would be nice if the site shows doctor names who allow VBAC. My and alot of my friends are looking for ones in CA, but still no results. This would be a great profit idea for the VBAC doctors.